Lessons from financial investing and a technique called Cascading Buckets can improve the results of your business development efforts for your consulting firm. 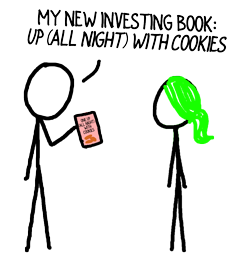 I learned investing from reading One Up on Wall Street, the Investor’s Business Daily, and Rich Dad, Poor Dad. Actually, that’s not true. I read those excellent sources but I’m still less apt to follow their advice and more apt to sink my money into a Venezuelan cacao company in the vain hopes that even if the investment doesn’t return zillions, at least I’ll wallow in an endless supply of chocolate. One investing idea did stick, though: the importance of creating a portfolio with a mix of investments (e.g., cacao and Brazil nuts.) Portfolios balance risk, improve your return, and taste better. Apply the portfolio concept to your quest for consulting revenue. In other words rather than focusing on whoever’s within reach or on whatever tactic is easy, think about the mix. Current Clients – Active clients represent the easiest and fastest source of new business. You (should) have a strong, trusting relationship, and you’re positioned to jointly identify additional, value-creation opportunities. A1 Prospects – The A1s in your contact list are decision makers with whom you possess a strong relationship. (See my segmentation scheme, referenced here and detailed in this book.) Often these are past clients, and they’re the second most likely source of new consulting projects in the short term. Outer Core – Following my segmentation approach, the remainder of your network core populates this group; the B1s and A2s who, with nurturing, could evolve into clients. New Blood – Folks who, today, are new to your network or are just finding out about your services make up tomorrow’s network core and new clients. You need a constant supply of fresh prospects to build a sustainable, lucrative consulting business. Now, let’s distribute your time and effort on the Five Marketing Musts (explained in this book), including networking, across your portfolio using Cascading Buckets (which is the name of either an excellent technique or an episode of I Love Lucy). 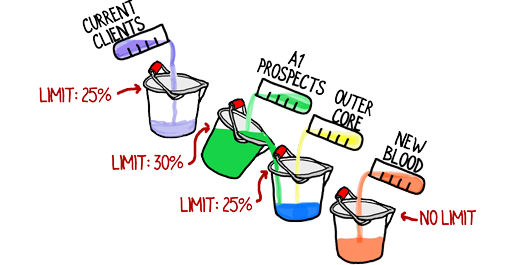 In Cascading Buckets you fill each bucket with as much time and as many contacts as you have, until you reach the limit for that bucket, then you pour your efforts into the next bucket. For instance, if your active client list consists of one company, you’ll probably spend little time filling the Current Clients bucket before moving on to A1 Prospects. However, if you’re servicing 20 active clients, you’re likely to hit that bucket’s limit, at which point you move on. This portfolio approach is self-balancing. The fewer high-likelihood prospects you have, the more you’ll focus on bringing in New blood. Many of your marketing activities will touch more than one bucket. The key is to constantly ensure you are building your portfolio of prospects. 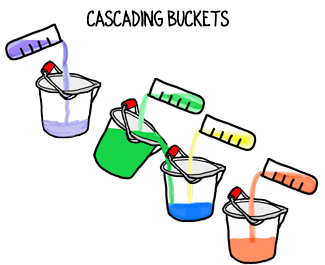 The Cascading Buckets approach prevents you from devoting all your visibility-building energy to existing clients or to general marketing. What do you think of the portfolio approach and Cascading Buckets for your consulting firm? A consultant wrote to me today about this article suggesting that many consultants get stuck in the first bucket, attending to their current clients and never getting to new business. That’s a fair concern… if you never get to new business. I should have mentioned in the article, that at a minimum 20% of your time should be spend working for your best, long-term client: “New Biz Co.” You have to devote yourself to developing new business just as diligently as you do to any other client. Any tips on moving those Outer Core to A1 prospects? B1s are decision makers with whom you have a weak relationship. The path there is clear: build the relationship! That means reach out and focus on them. Add value where you can, but don’t force it. Consultants make the mistake of thinking that if they only push a bit harder, they’ll get a project. That’s misguided. Most of the time you’re not winning the project because the client doesn’t see the need for your services. (It’s an Impact issue.) Your role is to stay connected so you’re top of mind when the problem arises. Many consultants start with just a couple of A1s. The two paths above are how you nurture and grow your Network Core until your A1 space is packed with prospects. As always, David, thanks for sharing your great insights. I’ve gotten stuck over my last two proposals with endless revisions to the proposals and, in one case, even face to face meetings (3 to finalize and be awarded the engagement) and then 1 more for a component of the engagement we were not awarded (HR is going to handle this aspect) but, of course, they still wanted our input. Any ideas on putting more and more boundaries? I’m using your template for my proposals. Katharine, when proposals go through “endless revisions” that’s usually a sign that the desired outcomes weren’t clear at the start. The Context Discussion is designed to create that clarity, though there are certainly executives who’s direction is as consistent as the wind. My suggestion is that you practice the context discussion and get agreement to all the components before submitting a proposal. (There’s more on this in the new book.) Feel free to reach directly via email or phone. Beware of “Thanks for showing me what needs to be done and how to do it. Now, I’ll do it myself or retain a B-list consultant”. You will likely smell this brewing and know when to require commitment or bail-out. Don, I agree that “brain-pickers” are a watchout. A prospect who believes they can solve their problem after merely talking with you for an hour was never going to award you a six-figure project in the first place; however, that doesn’t mean you have to continue investing time in them. Thanks for highlighting that point. David, Thanks for the great advice! Absolutely, Sugath. My recollection is you have a variety of businesses. It’s affirming for the community of consultants to know that someone with your breadth of experience finds these approaches useful. Thanks for posting a comment. Can you comment more on the “outer core”? What letters/# are the outer core? Also, when you meet new blood, it seems to me that they could be a B or a C initially. Debbie, outer core is B1s and A2s. 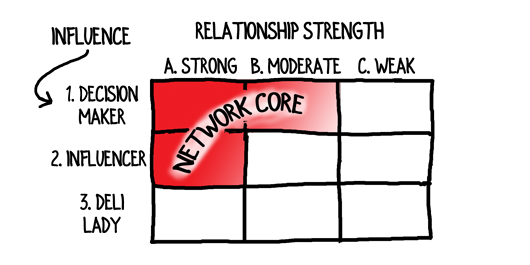 They’re your Network Core but not A1s. New Blood isn’t anything initially… because they’re new! You could, I suppose, call them Cs, but that implies you’ve somehow met them or pulled them into your network previously. New Blood is meant to be new introductions – an expansion of your network.